Pinellia ternata is a traditional Chinese herb which has been used in China for over 1,000 years. A soft-rot disease characterized by water-soaked lesions and soft-rot symptoms with a stinking odour was commonly observed in cultivated fields of this plant, and Pectobacterium-like bacteria were consistently isolated from the infected tissues. Two typical strains (SXR1 and ZJR1), isolated from Shanxi and Zhejiang, respectively, were identified. Pathogenicity tests revealed that these strains were virulent to P. ternata and induced the same symptoms as observed in the field. Characterization involving fatty acid profile, metabolic and physiological properties, 16S rDNA sequence and PCR-RFLP identified both isolates as P. carotovorum subsp. carotovorum (Pcc). The 16S rDNA of both isolates shared 97–99% sequence similarity with that of Pcc strains. The phylogenetic trees showed that both isolates were clustered in the group of Pcc and P. carotovorum subsp. odorifera and both PCR-RFLP profiles were consistent with the pattern E produced by the minority of Pcc strains. Thus, isolates SXR1 and ZJR1 were characterized as Pcc in spite of some differences. 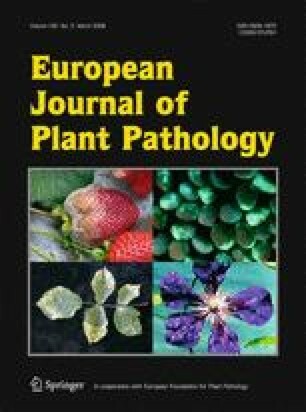 This is the first report that Pcc has been proven as a causal agent of soft-rot disease on P. ternata. The studies of morphology and G+C content were performed at the Analysis Centre of Zhejiang University. This research was financial supported by the National High Technology Research and Development Programme of China (Project no. 2006AA10Z428).